Despite poor production quality, this video offers exciting tournament footage combined with excellent instruction on taking one's tennis game to the next level. Andre Agassi and Nick Bollettieri describe and demonstrate some of the basic skills needed to play aggressive and competitive tennis -- both mental and physical. Conditioning drills are presented, along with advice on improving forehand, backhand, overhead, and serve strokes. 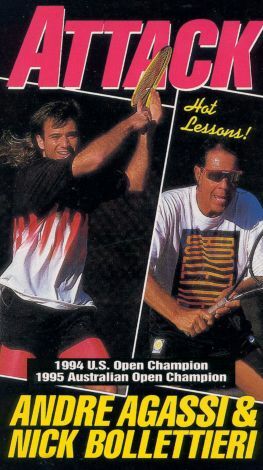 Attack: Hot Lessons - Andre Agassi & Nick Bollettieri is not too technical, but serves as good general advice for intermediate tennis players who want to improve their games.